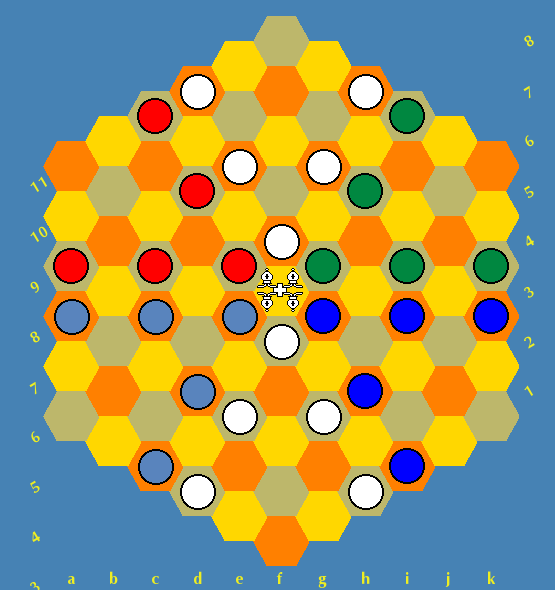 The idea here is to play on an hexagonal board starting from random setups following the Cetran Chess 2 style, maximizing the complexity of the game. King, Queen, Rook and Knight move as is usual in FIDE Chess. Chancellor moves each time as Rook or Knight. Archbishop moves each time as Bishop or Knight. Dragon Horse moves each time as Bishop or Wazir (Wazir = one orthogonal step horizontally or vertically). Gryphon steps one space diagonally then slides like a rook. Aanca steps one space orthogonally then slides like a bishop. Sissa moves each time as Rook AND Bishop following a movement pattern of the form nR+nB or nB+nR, where n is any whole number. nB+nR means "first n squares like Bishop followed by n squares like Rook". 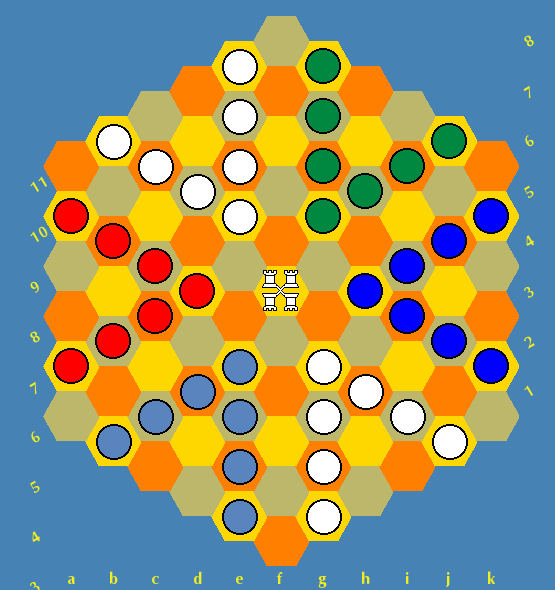 Then, if for instance n=5, sissa MUST MOVE 5 squares as Rook followed by 5 squares as Bishop or viceversa. There is no restriction on the movement direction of the second stage respecting to the first. Sissa doesn't leap. All squares it passes by must be empty. Pawns move and capture like in Dave McCooey's Hexagonal Chess, and must be promoted by any piece other than the king upon reaching the adversary's home row. A pawn may promote to a Queen, Sissa, Chancellor, Archbishop, Dragon Horse, Gryphon, Aanca, Rook or Knight, regardless whether such pieces still be on the board or not. The same as those of Dave McCooey's Hexagonal Chess, except that here the central pawn also can make an initial double step move. Of course, there is no castling and the object of the game is to checkmate the adversary's King. 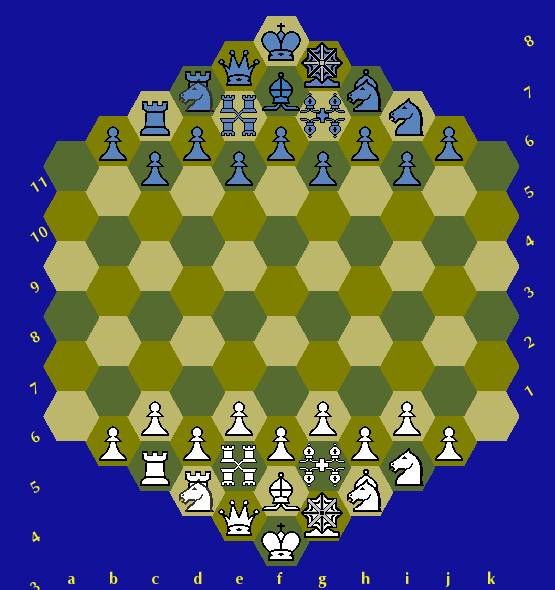 Given that the preset has no enforced the rules, it is necessary to apply the following PREGAME RULE: If the preset generates any particular position such that White could capture any undefended pawn, then White will have to pass and Blue will have to delete that log, then proceeding to generate a new setup.